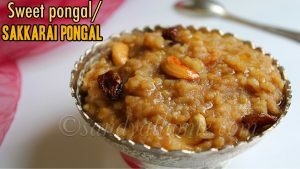 Sakkarai pongal/ Sweet pongal/ Chakkara pongali is a delicious sweet recipe popularly prepared in South India during festivals. 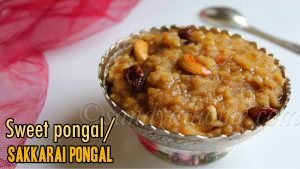 Sweet pongal/ sakkarai pongal is prepared with rice, moong dal and jaggery. Adding ghee, cashews and raisins enhance the taste of this dish even more. 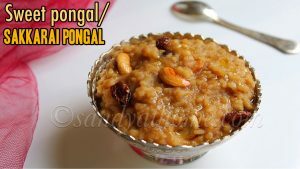 Sweet pongal holds top priority along with milk pongal during PONGAL festival which usually happens in mid jan, since only few days are left I thought to post this recipe to help out all my beginner friends. 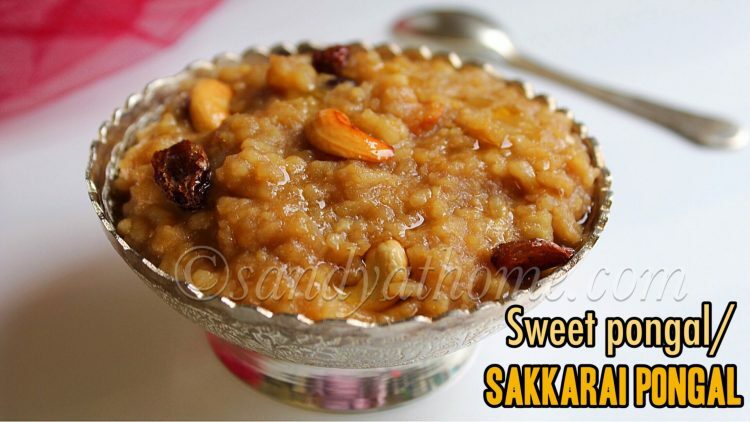 This is a very simple and easy recipe involving no jaggery syrup with string consistency which is a good news for beginners. 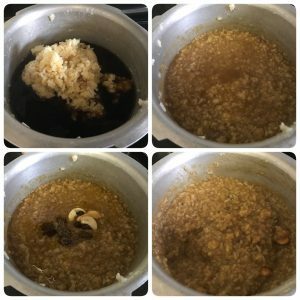 For the below recipe I used less quantity of jaggery which can be altered accordingly and also I used powdered jaggery and dint filter my jaggery syrup as I have never found any mud or impurities in it so far. As I always say everyone’s cooking and recipe is different and so is mine. So lets get to the making! 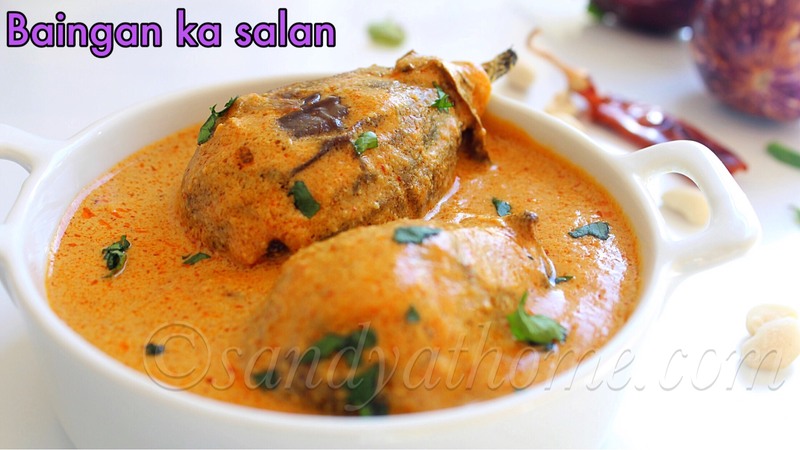 In a bowl/ cooker add rice and moong dal together. Wash and soak in water for 20 minutes. 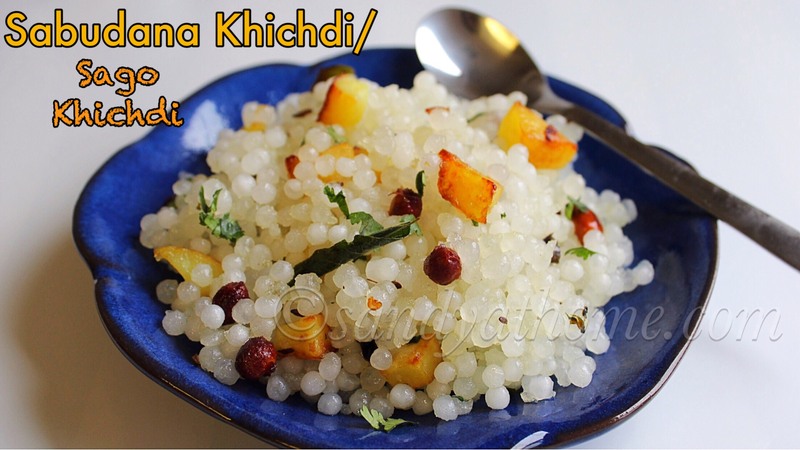 This will help the rice and dal cook fast. 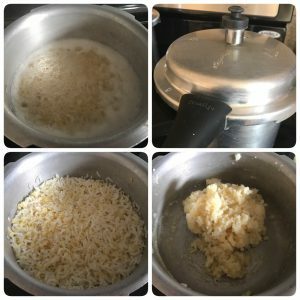 Now switch on the stove and keep the pressure cooker in which rice and dal is soaked.When the mixture starts to boil cover it with cooker lid and cook for 3 whistles or till done. (I used 2 cups of water to soak and cook for my rice and dal). When the pressure has subsided open the lid and mash the rice dal mixture and keep it aside. Now in a small pan add ghee, cashews and dry grapes. Fry until golden brown and put off the flame and keep it aside. Now in another pan add jaggery and 1 cup water. Mix well and allow the mixture to boil. 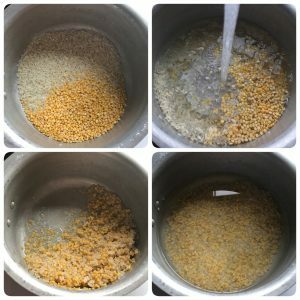 When the jaggery mixture starts to boil add the mashed dal mixture and mix well. Keep the flame in low and cook till combined. Now add the fried cashews and raisins along with ghee and cardamom powder. Mix well and put off the flame. Serve it!